Just because we take our cars to the car wash ever so often doesn’t mean that it isn’t tiresome or expensive. Now, we all know that good reliability comes with proper maintenance and car washing is exactly that. Although you can take your car to the washers over once in a while, it is a lot cheaper to do it yourself at home. 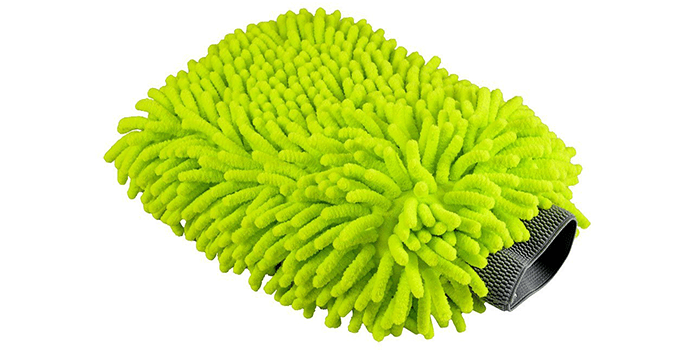 Most people employ a sponge or cloth for the job, of course, yet it seems that a car wash mitt is a lot more practical overall. Mitts like these can help you provide a much more thorough cleaning for your car without causing you any unnecessary fatigue. That explains why these mitts are so popular and why so many people seem to use them nowadays. That said, let us take a look at the ten best car wash mitts the market has to offer right now. The Chemical Guys ACC 105 Premium Extra Thick Wash Mitt is an extra plush, scratch-free glove that is uniquely crafted and designed with ultra-soft, genuine synthetic wool microfibers. Oil-free and extra-large in size, it can hold tons of suds and water at once, giving you a faster washing experience. Thanks to the durable elastic wrist band, it ensures the glove stays on during the cleaning process. Lint-free, convenient to use and extremely durable, these gloves can be machine washed and hung dry for better maintenance. The Chemical Guys ACC144 Bear Claw Scratch Free Premium Wash Mitt is an extra plush, scratch-resistant, premium grade car wash mitt made with soft synthetic wool fur. Designed with the ability to hold an excess amount of suds and water, it comes with an elastic wrist band that ensures the mitt does not slide off while you clean. Thanks to its soft fur, it traps in all traces of dirt and dust while preventing swirls and scratches. Owing to its large size, it can hold 5 times the soap and water, providing you with a quicker cleaning experience. Durable, convenient and reliable, these mitts should be machine washed and hung dry after every use. Available in a pack of 2, the Meguiars X3002 Microfiber Wash Mitt is a heavy duty, ultra-soft car wash glove designed to provide a scratch-free performance. Thanks to its extra plush microfibers, it lifts and easily traps all traces of dirt and dust, leaving your car shiny with a clean finish. Lint-free, scratch free and clear-coat safe, this set of car wash mitts are easy to maintain and should be machine washed for added durability. Uniquely crafted and designed with 100% high-quality pure lamb’s wool. This pair of car wash mitts from Mary Moppins aims at thoroughly cleaning your car while ensuring it protects its finish. Ideal for painted and gel coated finish, this pair of car wash mitts works great with RV’s, trailers, motorbikes, vans, toy haulers, trucks and more. To maintain their long-lasting durability and thickness, these wash mitts should be hand washed and air dried after every use. 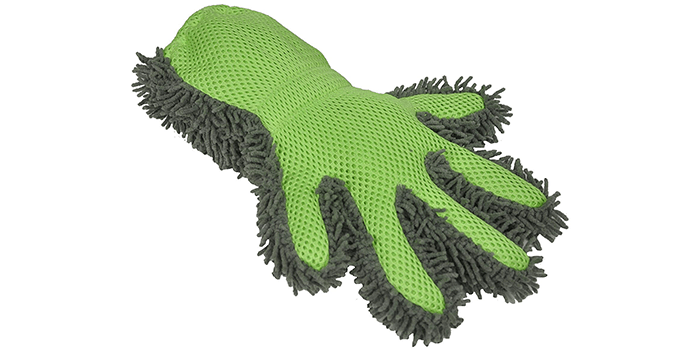 The Detailer’s Preference Eurow Microfiber Interior & Exterior Cleaning Glove is the ideal wash by most metrics, on that is designed to clean hard to reach areas. Great for car washing, these gloves come with a dual-sided design including one side that can be utilized for cleaning and dusting and the smooth side for scrubbing. Crafted with heavy-duty, premium quality material, these gloves offer optimum durability and performance. Thanks to its ambidextrous design, it can be utilized both by right and left-handed users. Anti-scratch, free from lint and swirls, this is a premium quality car wash glove that is made with high-end plush microfibers. Designed with premium quality materials, it comes with optimum absorbency and is gentle on your car. Available in 4 vibrant colors, including pink, black, blue and green, this car wash mitt can be machine washed and is easy to maintain. Featuring an elastic band on the wrist area of the mitt, it ensures the glove does not slide off and prevents any water from seeping in. 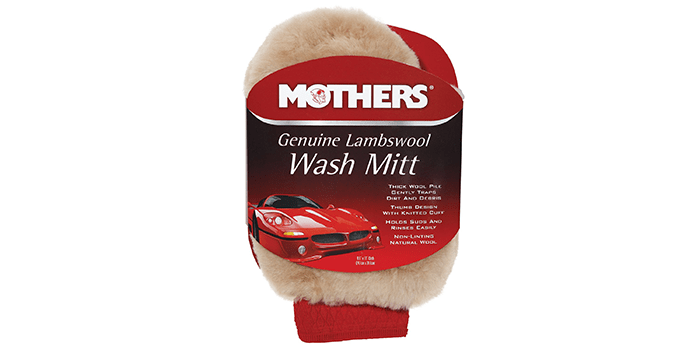 Crafted with premium grade thick wool, the Mothers Genuine Lambswool Wash Mitt aims at trapping and removing dirt and debris from your car without damaging its paintwork. Featuring a thumb design with a knitted wrist band, it offers optimum control while cleaning and ensures your hand stays comfortable. Featuring 100% lint-free, all natural wool, it is clear-coat safe, holds more suds and rinses off with ease. Not suitable for machine washing, it should only be washed by hand and air dried for optimum durability. 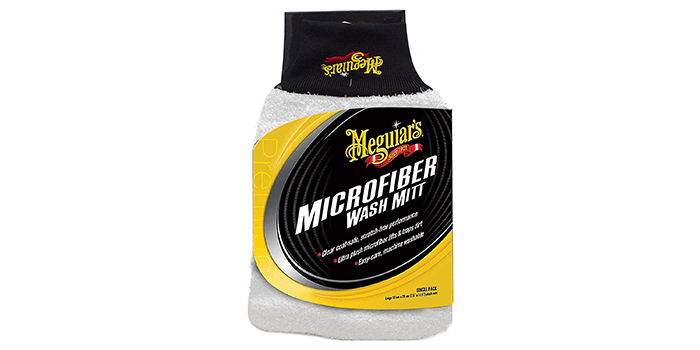 Made from premium grade super-absorbent microfibers, the Meguiar’s X3002 Microfiber Wash Mitt is designed to carry more suds for a quick wash. Thanks to its soft lint-free material, it helps in lifting off and trapping all traces of dirt and grime, leaving your car with a swirl-free, shiny finish. Measuring 8 x 10 inches in size, this car wash mitt can be machine washed and reused at will. Suitable for both dry and wet washing, it can be utilized with any car wash soap with no limitations to speak of. 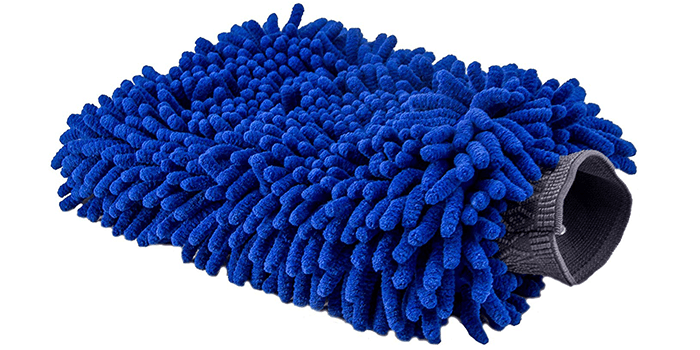 Delivering a scratch-free, lint-free, super shiny performance, the Relentless Drive Ultimate Car Wash Mitt comes equipped with a double-sided chenille microfiber covering. Featuring extra plush microfibers and extra-large in size, these mitts are ultra-safe on all kinds of surfaces including the clear-coated and gel paint surfaces. 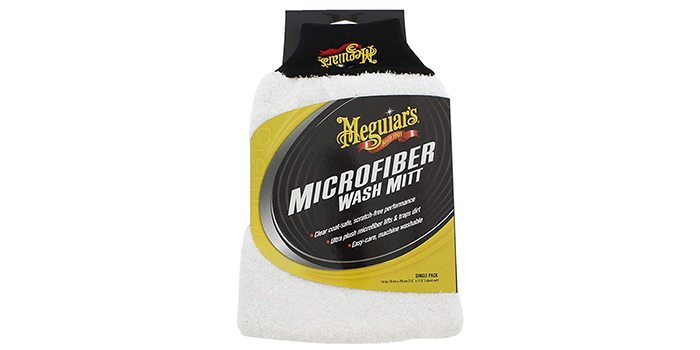 Ideal for washing cars, trucks, trailers, RV’s, boats and more, its heavy-duty strands wipe away and remove all traces of dirt and grime, leaving your car with a swirl-free, scratch free finish. 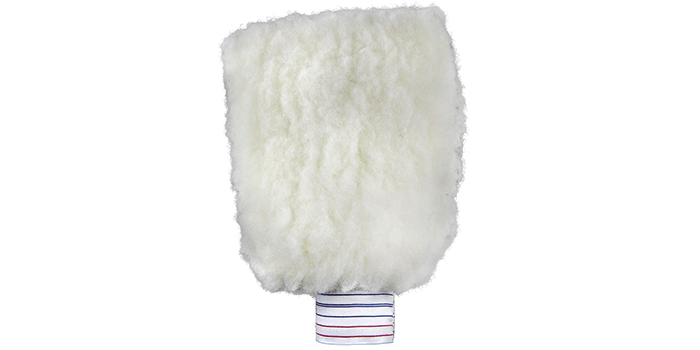 Thanks to its thick microfibers, it helps in absorbing and holding more water as compared to sheepskin gloves. The Chemical Guys MIC499 Big Mofo Premium Wash Mitt is an extra-large car wash glove that stands out through its impressive size and ease of use. Crafted with 75 lbs of extra plush scratch resistant, lint-free microfibers, this wash mitt is extra absorbent and extremely soft. Featuring a double stitched, heavy-duty, elastic wrist cuff, it ensures that the mitt stays in place and does not slide off during the washing process. Ideal for cleaning and washing cars, trucks, trailers, and RV’s, this washing mitt can hold tons of water and suds, making your cleaning experience quicker and stress-free.